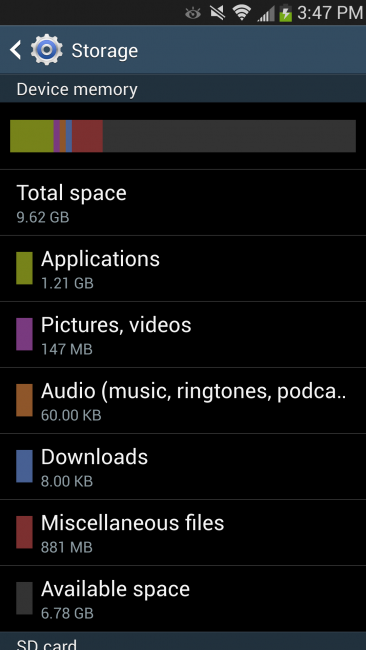 When news broke that the 16 GB Galaxy S4 only let you have access to 9 GB of the internal memory, users were rightfully a bit angry. It is understood that system partitions eat into some of our space, but gobbling up half of the storage promised is cause for concern. After Samsung suggested that people used SDcards to expand that space, it seems that they may be looking for another solution to the problem. In speaking with CNET, a Samsung spokesperson said they are “committed to listening to our customers” and that they are “reviewing the possibility to secure more memory space through further software optimization.” There was no timetable given for this reviewing process and that doesn’t mean it will even come to fruition. If Samsung can find a way to cut down on the size of their partition, S4 users could see some storage coming back their way.